An old friend once told me that the best cure for writer's block was to write. I suppose the same principle applies to blogging. We have had a busy, busy spring, the biggest excitement being that we have become homeschoolers. I will get to that in the days to come. For today, I thought I would share a few snaps from our spring adventuring. In Northern Ontario, some say, there are two seasons~ winter and blackfly. (**officially as determined by the first family member to get bit... this year it was Rowan). So, this past Sunday, in anticipation of our enforced captivity, we had a an afternoon of outdoor play with good friends and happy dogs. The sun was shining and the ditches were full of water. 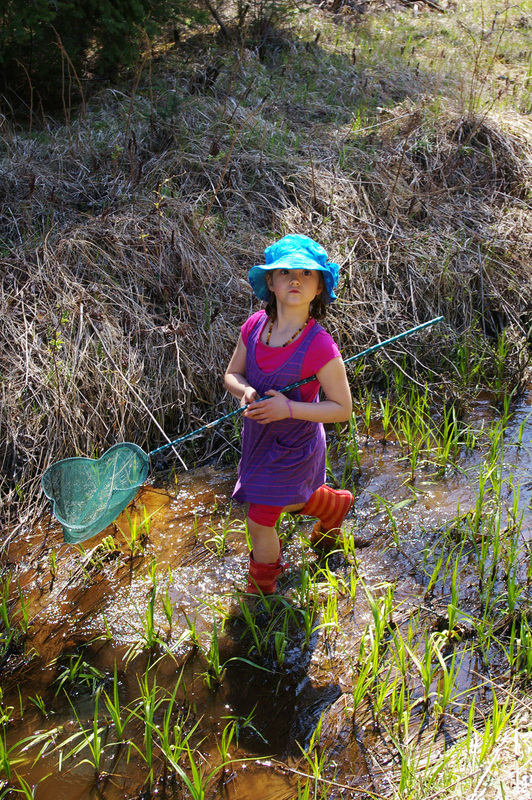 I am very clear with my child that spring run off makes for dangerous waterways. I am not sure that this day set the best example of that rule... because the ditches were where we found the frogs and minnows. And where all three kids, both dogs (neither fans of swimming) and two out of three adults ended up. Children + water = mud. 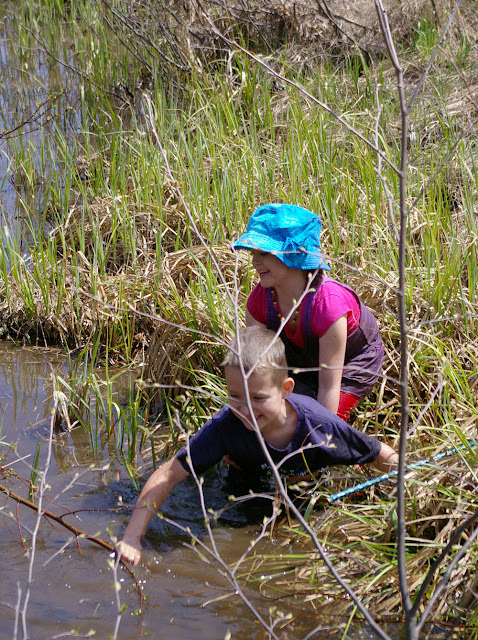 They were actually swimming in the ditch (gosh, that makes for parent of the year material when you read it in print, doesn't it?!). We're not sure who went in first, but it didn't take long for all three to be drenched. The problem arose when a foot got stuck deep in the mud. Concerns about quicksand and crocodiles were quickly dismissed. 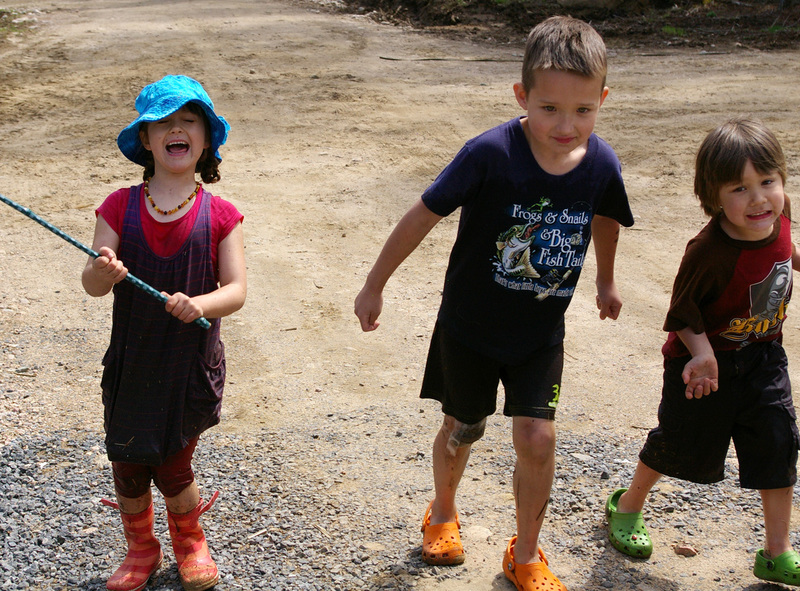 Rowan discovered the joys of filling your rubber boots with mud while your feet are still inside. 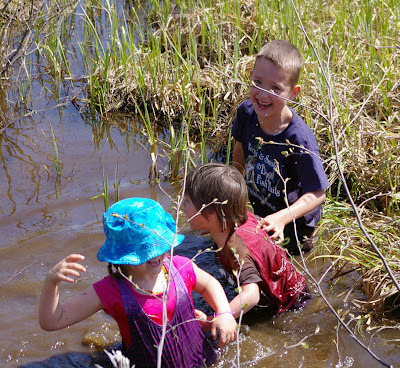 Nothing says childhood in spring like the splooshing sound that makes! 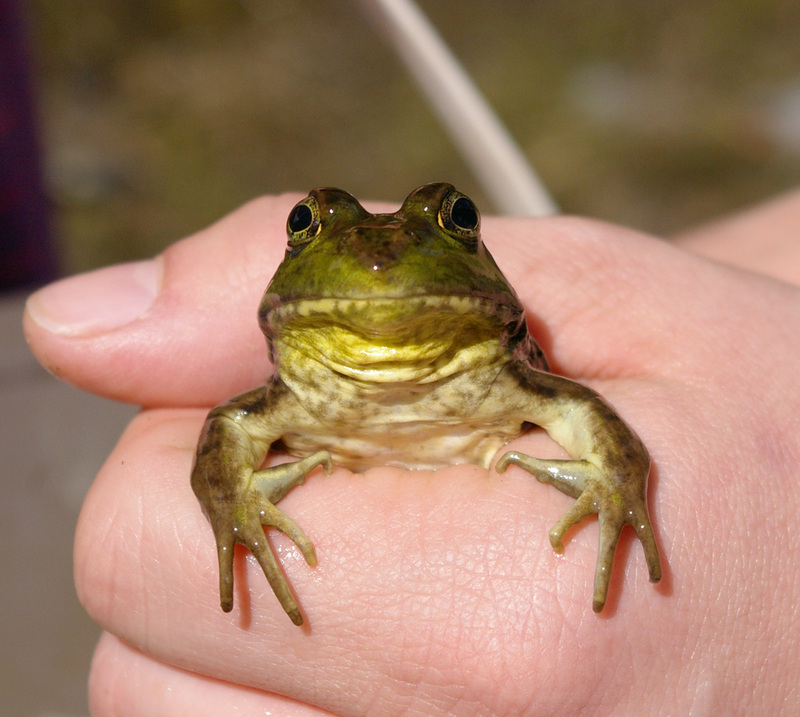 Wet, cold and muddy they headed home for dry clothes having caught and released their frogs and one single minnow. I freely admit that I was the one person who did NOT get wet. My excuse was that I had the camera (more realistically, I was the only one without a change of clothes at hand!). 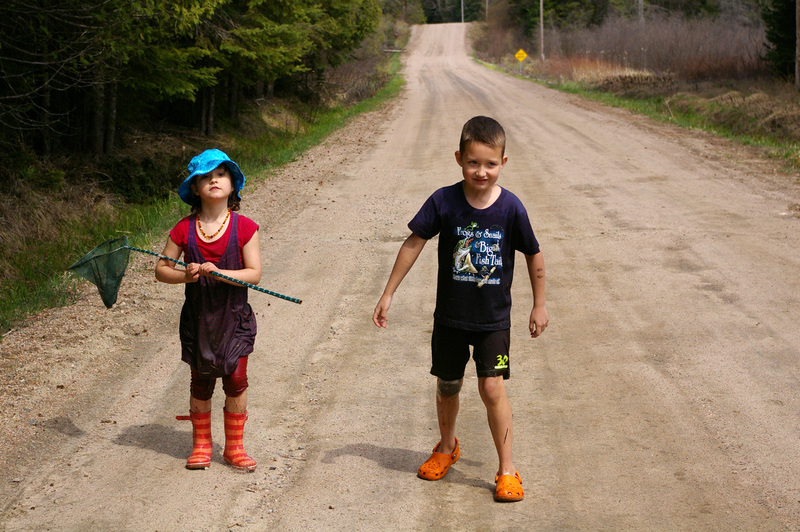 The kids ended their adventure looking like a trio of swamp things or zombies coming up the lane. In this last picture, note my daughter's face. I just told them they looked like zombies... and she REALLY doesn't like zombies. Wow! What a fun day. Almost makes me wish my kids were little again. 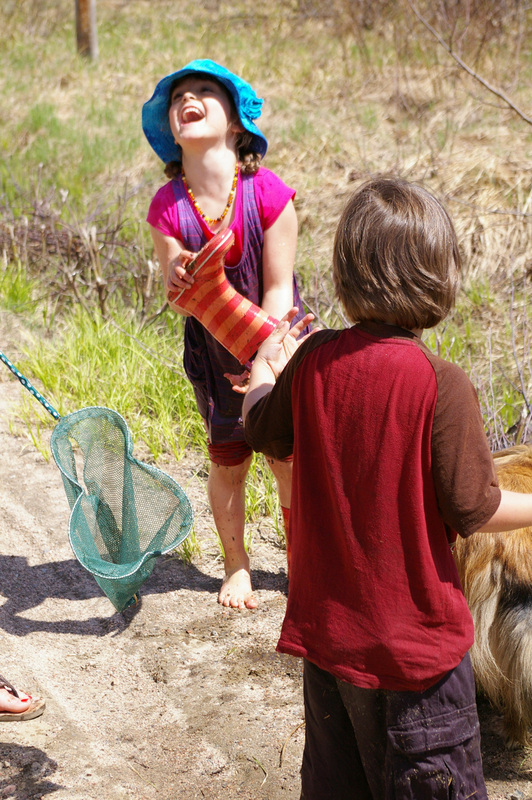 There is not better classroom than the great outdoors. So much fun and the smiles on their faces says it all.